How to burn video files to DVD easily? Current Page: Xilisoft > DVD Creator > How to burn video files to DVD? First, let us know more about what is DVD. DVD is movies on a shiny disc, and much more. It's an optical disc storage technology for video, audio, and computer data. DVD is essentially a bigger, faster CD that can hold high-quality digital video, better-than-CD audio, pictures, and any other sort of digital information. DVD encompasses home entertainment, computers, and business information with a single digital format. It replaced laserdisc, videotape, many video game cartridge formats, and many CD-ROM applications. How to preserve precious videos better? Usually, we will burn our favorate movies to DVD to better save them and enlarger our computer space. How to burn video files to DVD? Now I suggest you use Xilisoft DVD Creator. 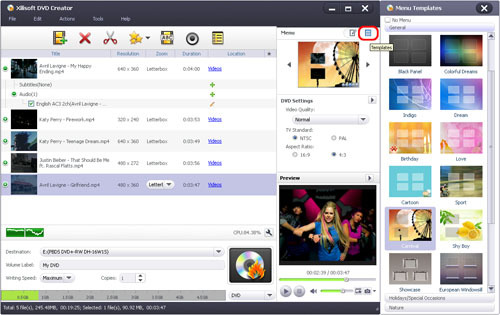 It can convert and burn almost all video files to DVD, such as AVI, MPEG, WMV, DivX, XviD, MP4, DV, VOB, ASF, 3GP, YUV, H.264/AVC, M4V, iPhone 4 videos (MOV) to DVD, moreover, burn DVD with custom menu, audio tracks, subtitles, video thumbnails and video effect. 1. Download Xilisoft DVD Creator and install to your computer. Insert a DVD+R (DVD-R, DVD+RW or DVD-RW). Run the DVD Creator and add the files you want to convert by clicking 'Add Files' button under the 'File' menu. 4. You can start to burn the video file by clicking "Start Burn" button. Or you can click "start burn" button in the main interface. After the file is burned, you will be able to enjoy your beloved video files on any DVD player! You can know more detailed info about burn DVD movie, and free download it to have a trial right now.